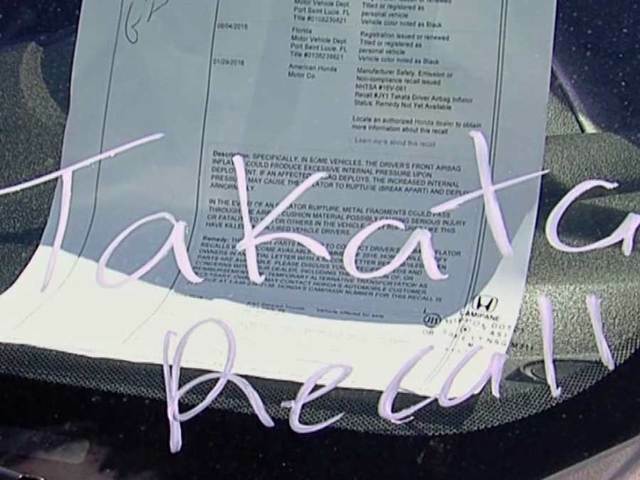 At a news conference Thursday following a first of its kind law suit that was filed in Palm Beach County yesterday an area car dealer accused another dealership of unlawful sales practices. Earl Stewart said he stopped selling used cars with faulty Takata airbags in July and says he wants his competitors to do the same. The recall of Takata airbags affected more than 34 million vehicles and the faulty airbags have been blamed for 11 deaths in the United States according to federal investigators. The airbags can cause metal fragments to shoot out of them in the event of a crash. Replacement parts are in short supply so the majority of cars have not been fixed. The lawsuit filed in Palm Beach County claims Arrigo Enterprises is selling vehicles with recalled Takata airbags that have not been replaced, without telling customers. WPTV spoke with Jim Arrigo, of Arrigo Enterprises, who answered Stewart’s allegation saying, “it’s simply not true” adding “If I have to lie to someone to sell them a car, I won’t sell them a car." It is currently legal to sell used cars with an open recall that hasn’t been fixed. When asked about why Stewart mentioned just one competitor in the suit, even though an alleged undercover investigation showed other car dealerships following the same practice, his attorney Jack Scarola said Arrigo was the most egregious. Arrigo said he was surprised by the lawsuit and was not notified by his competitor in advance. “It’s really disturbing when a fellow dealer calls me out,” Arrigo said. He said his sales staff give prospective buyers a CARFAX report that they sign to acknowledge they are aware of possible recalls. “We give everybody all the tools they need to know about that vehicle before they purchase to make a conscious decision that that is what they really want," Arrigo said. He said they will continue to sell recalled cars but not cars with recalled Takata airbags. Stewart is suing under the Florida Deceptive and Unfair Trade Practices Act (FDUPTA). WPTV Legal Analyst Michelle Suskauer called that unusual because this is a consumer protection law. Suskauer believes that if Stewart were to win there could be legal ramifications. "This is going to put every dealership on alert," Suskauer said. Arrigo says he’s talked to people in the industry to do something about the recalled airbags. “Earl says he’s the only dealer taking steps, I take offense at that,” Arrigo said. Both Arrigo and Stewart agree that it’s an important issue and one that lawmakers will eventually need to do address.